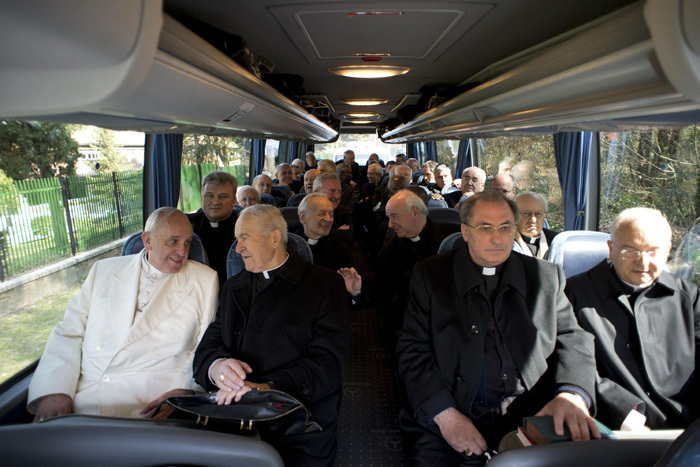 ROME (CNS) — If you get a seat on a crowded bus or train, you should use your travel time to read a few lines from the Bible, Pope Francis told members of a suburban parish filled with people who commute to Rome for work. “A Christian’s first task is to listen to the word of God, to listen to Jesus, because he speaks to us and saves us with his word,” the pope said March 16 during a homily at the parish of Santa Maria dell’Orazione on the northeast outskirts of Rome. Everyone should carry a small Bible or pocket edition of the Gospels and should find at least a few minutes every day to read the word of God, Pope Francis said. People listen to the radio, to television and to gossip throughout the day, but “do we take a bit of time each day to listen to Jesus?” Pope Francis asked. The Church of Santa Maria dell’Orazione, inaugurated in 2002, was packed for the pope’s Mass. Hundreds of people lined the streets leading to the church to watch the pope pass by, and many residents went on the roofs of neighboring apartment buildings to get a glimpse of him. Pope Francis began his evening visit to the parish with the younger generation. Father Francesco Bagala, pastor, told the Vatican newspaper the parish has more than 100 infant baptisms each year, and 450 young people are in classes preparing for first Communion or confirmation. The pope also met with the sick and people with disabilities and heard confessions before Mass. After the Mass, he went on to the rooftop terrace of the church to greet the hundreds of people gathered outside. He asked them to pray for him that he would be a good bishop and not make too many mistakes. Pope Francis also asked people in the square to pray for the passengers and crew members — and their families — of Malaysian Airlines flight that went missing March 8 after taking off from Kuala Lumpur on the way to Beijing.